Phuket is the biggest island in Thailand, located in the Andaman Sea, of southern Thailand. The island is mostly mountainous, with a mountain range in the west of the island going from the north to the south. Phuket Island has 17 sandy beaches. The island is 50 km long, north to south, and 21 km wide. It is joined to the mainland by Sarasin Bridge. Phuket used to make its wealth from tin and rubber. It also has a rich and colorful history. The island was part of one of the major trading routes between India and China, and was frequently mentioned in foreign ship logs of the Portuguese, French, Dutch and English traders. The region now makes much of its income from tourism. Big Buddha: Phraphutthamingmongkhol-akenagakhiri Buddha, is has a width of: 25.45m and a height of: 45m. It is a reinforced concrete structure adorned with white jade marble, called Suriyakanta, from Myanmar (Burma). The statue is positioned on the top of Mount Nagakerd, Subdistrict Karon, Phuket Province. 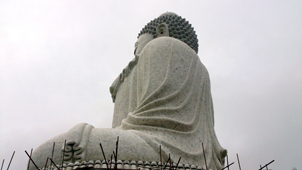 Buddhists who practice the religion of Buddhism built the Big Buddha. It is one of the landmarks of Phuket Island and because it is located on top of the mountain, it has one of the most beautiful viewpoints of Phuket. 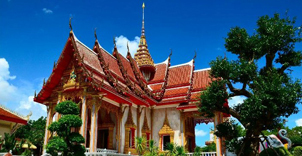 Chalong Temple: This is Phuket's most renowned and beautiful temple. It is enshrined with gilt statues of monk-hero Luang Pho Chaem and his assistant Luang Pho Chuang, both having important roles in quelling the miner rebellion in 1876. Wat Chalong and its beautiful Buddhist architecture, is not only of importance to the locals but it will also allow tourists to take good memories back home. Old Phuket Town: The old town of Phuket is a place that attracts tourists to visit the beautiful Sino-Portuguese style Architecture. It is a perfect combination of traditional and modern culture making it a place perfect for photography to capture the memories of visiting Phuket. Come let us help Orphan Children’s Hopes & Dreams Turn Into Reality! On the other side of the civilized Phuket city, there are many orphanages waiting for some help and support. You can help poor children to make their childhood dreams come true. Help them to live with a smile & happiness. It is a great opportunity for a family activity, as todays children often grow up in a world of luxury, where toys, computers, food, shelter, and education is a given. Getting them involved in a charity activity or having a change to see at an early age the different lives that other children may have, is a great way to make them grateful for what they have. And possibly make generosity contagious! Phuket has been inhabited since the early days of mankind by ancient tribes and this still keeps archaeologists occupied in wanting to find out more about the history from the early days. On the ancient maps of the region, around Thailand's South West coast, a name, Junk Ceylon, can be seen, describing a stopover on the route between India and China, where seafarers stopped to rest. This place is known today as Phuket. Patong: Patong in Thai means, "the forest filled with banana leaves" and refers to the beach and town on Phuket's west coast. It is the main tourist place in Phuket, and it is the center of Phuket's nightlife and shopping. Patong Beach is famous for its nightlife and 3.5 kilometers (2.2 mi) of beach that runs the entire length of Patong’s western side. Karon: Karon Beach refers to a beach, and the town adjoining it, on the western coast of Phuket, Thailand. The beach is a popular destination for tourists. Generally quieter than neighboring Patong Beach, it is popular with families and couples. Karon is also especially popular with Scandinavian tourists, with many businesses catering for them. Kata: Located on Phuket's lovely west coast, Kata really does have all the elements of a perfect holiday. It is a small village, with just enough restaurants, bars and local color, to keep your occupied. Kata's main attraction is its curving wide sandy beach, providing masses of room to accommodate water sports such as cat sailing, parasailing, snorkeling and fishing. 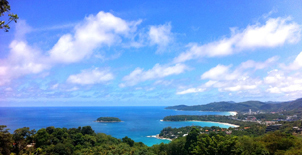 View Point: This is located midway between Nai Han and Kata beach. The scenic Kata Noi, Kata, Karon beach and Ko Pu Island can be viewed from this point. Two Heroines Monument: This is a monument in Amphoe Thalang, a memorial statue of the heroines, Thao Thep Kasattri (Kunying Jan) and Thao Sri Sunthon (Mook), who rallied islanders in 1785 to repel Burmese invaders. Thailand is known as the “Spa Capital of the World”, Phuket has a number of Spas offering Traditional Treatments. Please let us know and we will arrange to drop you at well-known Spa in the Island. It is located near by Naka Temple, that’s why local people call it Naka Open Market. You will find many things, such as a huge selection of clothing both new and second-hand, bags, shoes, fashion accessories, costume jewelry and items for home decoration. There is also a choice of electronic goods, mobile phones, watches, toys, plus CD's and DVD's (watch our for, and avoid the pirated ones). The beauty of Thai jewelry is that it is well known the world over. The quality of precious stones, the design, cut, and polishing, skills of Thai artisans, all combine to give fame to the jewelry and gems. "Pearl of Phuket" one of Thailand's first integrated pearl producers and the only pearl producer in Phuket. The making of a pearl ornament is a complicated and delicate process, no matter what type of pearls it is, whether it is Mabe, Akoya or South Sea. The intricate process starts from the cultivation to the selection, cutting, designing and finally assembling. Phuket cashews have a reputation for their quality. The Methee Cashew Nut Factory has been growing cashew nuts for over 40 years. The factory sells cashew nuts in a variety of forms; plain, fried with garlic, fried with chili, coated with chocolate, honeyed cashew nut brittle and cashew apple juice. It is open from 7am to 7pm. In Phuket there are many shops offering great selections of dried food products like squid, shrimp, fish, pork and fruit, in wholesale and retail pricing, with excellent quality and service. , We are pleased to arrange trips to any place in Phuket and nearby provinces, depending upon your interest. For further information please feel free to contact us via email.